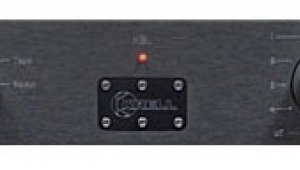 The YBA 2's maximum line-stage gain for all the inputs other than Aux measured a sensible 16dB at 1kHz. 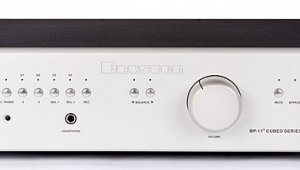 The internal resistor in series with the Aux input reduced the gain to 6.7dB, which will be enough for sources with very high outputs—the Theta processors, for example. 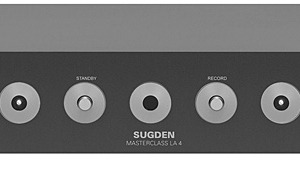 The MM phono-stage gain, measured at the tape outputs, was 34.1dB. Line input impedances were lower than specified, at 30k ohms, though the Aux offered 85k, due to the resistive padding. 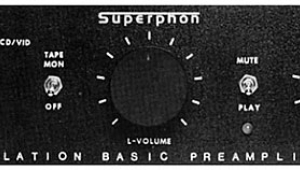 The MM phono input impedance, measured at 1kHz, was 54k ohms. 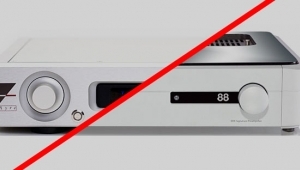 Both line stage and phono stages inverted polarity, meaning that LP playback will be correct (two inversions equal non-inversion). (I did compensate for this in the auditioning.) The line stage was quiet, its unweighted S/N ratio (measured from 22Hz to 22kHz with the inputs shorted and the volume control at maximum) being an excellent 91dB ref. 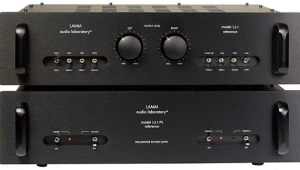 1V output in both channels. The MM stage was also very quiet, its unweighted S/N ratio measuring 93dB/89dB (L/R) ref. 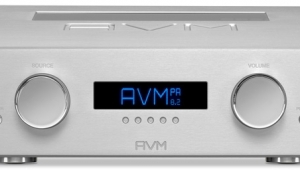 1V output, which equates to 81dB and 77dB referenced to the standard 5mV input level at 1kHz. 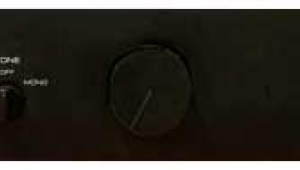 Though each channel has its own volume control, the tracking between these detented pots was relatively accurate, the maximum interchannel error above the 12-noon position being 0.1dB, and more often 0.02dB. The error increased at low volume settings, however, reaching 0.6dB between 10:00 and 9:00. The steps between detents were just less than 1dB above 12:00—which was the nearest to a unity-gain position, with a measured gain of 0.65dB—increasing to 2dB, then 4dB at lower volume-control settings. 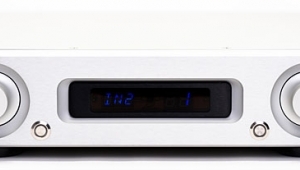 This could prove inconvenient in systems using both a digital source with a very high output level connected to something other than the Aux input and/or a very sensitive power amplifier. The line-stage frequency response (fig.1) was astonishingly flat, not reaching 0.35dB down until 200kHz. (Note the expanded horizontal scale in this graph.) There was some slight dependence on the source impedance: driving the input from a 600 ohm source doubled the drop at 200kHz to -0.7dB. The extra shunt capacitors on the "Video" inputs didn't have any effect at these frequencies, however. You can also see the excellent channel matching, revealed by the fact that the dotted right-channel trace almost exactly overlays the solid left-channel one. The lower traces in fig.1 are the RIAA error, dropped by 2dB for clarity. While the left channel is again superbly flat, the right channel has a slight lift in the treble, reaching +0.25dB at 20kHz. Line-stage channel separation was also excellent, as can be seen from fig.2. The gentle rise in crosstalk above 1kHz is due to capacitive coupling between channels, but this is still very low in absolute terms. 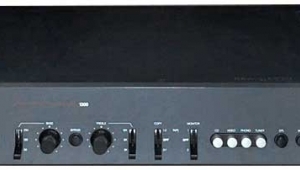 Fig.1 YBA 2, frequency response of line stage with v/c at maximum (top); and phono stage RIAA error (bottom) (right channel dashed, 0.5dB/vertical div.). Fig.2 YBA 2, line-stage crosstalk with undriven input shorted (10dB/vertical div.). 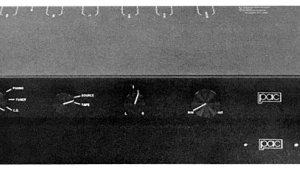 Phono-stage crosstalk, measured at the tape outputs, was nonexistent, due to the circuit's physically separated, dual-mono construction. The close proximity of the various input jacks, however, did lead me to check the inter-input separation. 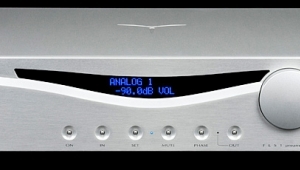 Below 1kHz, any coupling into the tuner input from the CD input was below the noise. At 20kHz, however, the crosstalk from the selected pair of inputs to the adjacent but non-selected pair did rise to -78dB (L) and -67dB (R), this still negligible. 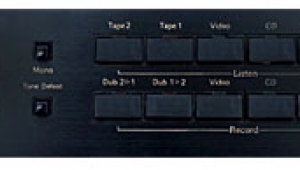 If both pairs of inputs were selected, these figures worsened by 15dB, but the crosstalk to the unwanted channel was still below the noise in the midrange and below. The YBA 2's line-stage circuit is very linear, as can be seen from the bottom traces in the graph of distortion vs frequency (fig.3). Phono-stage distortion (upper traces) was a little higher, but not so that it would present any problems. Line-stage linearity was, however, dependent on both load and level, as can be seen from fig.4. 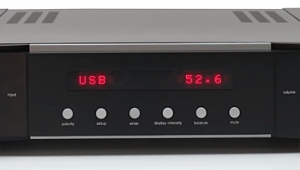 The distortion drops with output level to reach a minimum value around 600-700mV, meaning that, below that level, the reading is dominated by noise rather than harmonics. 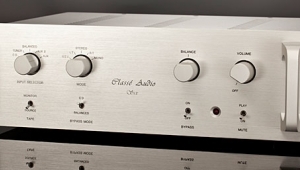 As the output level increases, however, the harmonic content also starts to rise, in a much less abrupt manner than is usual with solid-state designs. The maximum output voltage (defined as the level where the THD+noise content reaches 1%) into a high load—100k ohms—can be read from fig.4 as a hair over 7V. But into a very low load—600 ohms—the maximum level is just 2.3V. Note, however, the way in which the load impedance affects the measured distortion content. Unusually, the low load actually reduces the harmonic content at output levels below 1.8V, compared with the kind 100k load. Fig.3 YBA 2, THD+noise vs frequency (from top to bottom): MM phono stage at 25mV input at 1kHz; line stage at 100mV input (right channel dashed). Fig.4 YBA 2, distortion vs output voltage into (from bottom to top): 600 ohms, 100k ohms.